When most people think of “wedding season,” the time of year that comes to mind tends to be summer. In fact, as summer approaches, the amount of wedding invitations in your mail starts to pile up rather quickly. While summer is a fabulous time for an outdoor event or ceremony, there are other seasons that might be worth considering for your wedding. If you’re planning a wedding, don’t rule out a winter one just yet. 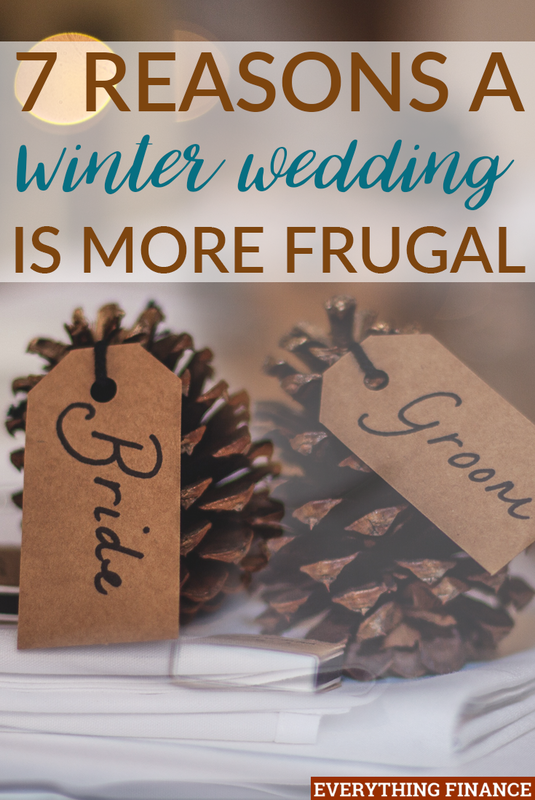 Not only can winter be a beautiful time of year for a wedding, but it can also be the key to a more frugal wedding. You don’t have to spend a fortune to have a beautiful day anytime of the year, however, winter might make that even easier while still allowing you to have almost everything you want. Here’s why a winter wedding should be at the top of your list if you want to have a frugal wedding. Since winter tends to see a steep drop off in the number of weddings, saying you’ll have your pick of venue is no overstatement. More than having your pick, however, you’ll also pay a lot less. Most venues and businesses drop their prices when their services aren’t as in demand. You may even be able to negotiate price depending on the leniency of the owner. One thing to consider, however, is whether or not said venue meets not only your requirements, but the requirements for a winter wedding as well. Some venues, such as barns, might not be equipped with heaters or easily accessible roads come winter, so be sure to carefully look into a place before writing a check. If the place is over-equipped and there’s things you can live without, maybe use that as a negotiation point as well. 2. Finding the Perfect Dress On Sale! If there was ever a time to purchase your dream dress, winter is it. Between Black Friday and Cyber Monday, you’ll likely have your pick of sales and great deals on any dress you could imagine. The same goes for bridesmaids’ dresses, which is bound to leave your bridal party happy. Furthermore, many bridal shops, such as Kleinfeld’s in New York, have winter blowout sales where you can purchase the dress of your choice at a steep discount; think 70 percent off. Still, even if you happen to miss these particular sales, you’ll probably find your dress at discount anyway since winter isn’t typically a busy wedding season. Most people expect to go to their fair share of weddings in the spring and summer, often with a little apprehension due to budgetary reasons. It’s expensive to attend a wedding! If you have a winter wedding, however, you’ll more likely than not be one of the few. That being said, it may be easier on family and friends in terms of spending the money they often have to for weddings. In fact, since yours is likely to be the only winter wedding, they’ll probably be more generous with not only their gift, but with their time and whether or not they’ll travel to be there. Moreover, if you were having a hard time cutting the list, again with savings on venue, among other things, you may also be able to invite a few more people. Apart from a select few holiday parties, most caterers find that they’re busy during the warm months. Businesses usually see an abundance of clients during the spring and summer, and like venue owners, see a decline come winter. Because of this, you’ll find that you can snag your favorite chef, or wedding cake baker, for a lot cheaper than you would during the summer. Furthermore, if you were hoping to serve your guests an actual meal as opposed to small appetizers, then a winter wedding is the perfect time to have your ceremony. Again, since caterers aren’t as busy, you’ll be able to serve a full meal for a fraction of the cost you’d normally pay and you can always utilize this slow time for negotiation as well. Instead of giving away the usual box of Jordan almonds, drink cozies, or sunglasses, winter offers up an array of wonderful and inexpensive favor ideas that are bound to delight your guests and save you money. You can DIY everything from cute hot chocolate kits, to scented pine cone fire starters, to personalized knit gloves for the cold season. A winter wedding provides many unique and useful options for wedding favors that don’t have to cost you a fortune. When everything is blanketed in fresh snow, the world looks a little more beautiful, at least in my opinion. No matter what’s going on with the weather, you’re bound to have beautiful pictures. Unlike rain in the spring, you can still take pictures in the snow. You also don’t have to worry about renting a place for pictures because literally anywhere you take them will look beautiful and surreal in a winter wonderland. Also, like venues and caterers, photographers see a slow season during the winter as well, which means photos for less. During the winter, you can save a lot on the decorations needed for your wedding. Instead of using tons of expensive fresh flowers, go with seasonal décor such as pine cones, berries, wood pieces, and evergreen branches. This not only looks more suitable for the season, but also saves you big money on decorations. You also probably have Christmas lights already on hand that you can use as well. Flowers are a huge wedding expense, so being able to only use a few or opt out completely helps keep your wedding significantly on budget. A winter wedding probably isn’t the first thing that comes to mind when you get engaged. Most girls dream of spring and summer weddings full of lush flowers and absolutely no snow. However, if planned right, a winter wedding can be just as beautiful as one planned during the summer wedding rush, while also being kind to your budget. Have you considered a winter wedding, or have you had one?